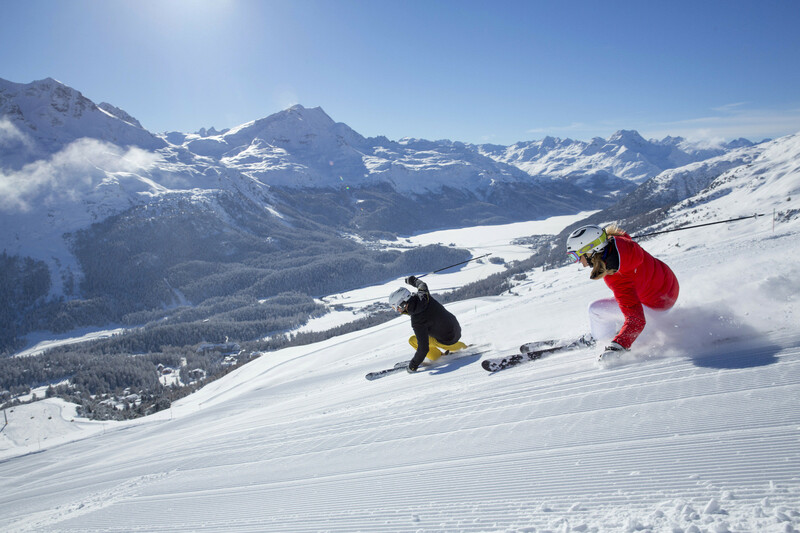 At the foot of the Julier mountain pass and amidst an impressive alpine scenery of lakes you’ll find the Swiss ski resort Corvatsch – Sils – Silvaplana. It is considered very snow-secure and offers many kilometres of slopes for skiing and snowboarding. Ski lifts bring you up to the highest mountain station in the Eastern Alps at an altitude of 3303 metres. From here you can ski down the so-called “king’s slope”, passing Hahnensee and ending in the nearby ski resort of Corviglia. On a ski holiday in Corvatsch – Sils – Silvaplana you will also get access to many other slopes of all difficulty levels, including Switzerland’s longest night slope. Apart from the slopes you can explore the snowy mountains of the Engadin winter hiking or snow-shoeing through the Corvatsch area. Taking a break at one of the lovely restaurants allows an impressive view on the surrounding lakes and mountains. Restaurants, shops, bank, post office, gas station, a zoo, and a nightclub.